Launched at Salone Internazionale del Mobile earlier this year, Jasper Morrison’s new 1 Inch Reclaimed chair stands out as a significant addition to the 1 Inch family with its simple shape, refined uniformity of a single material, perfect comfort, and quiet grace. 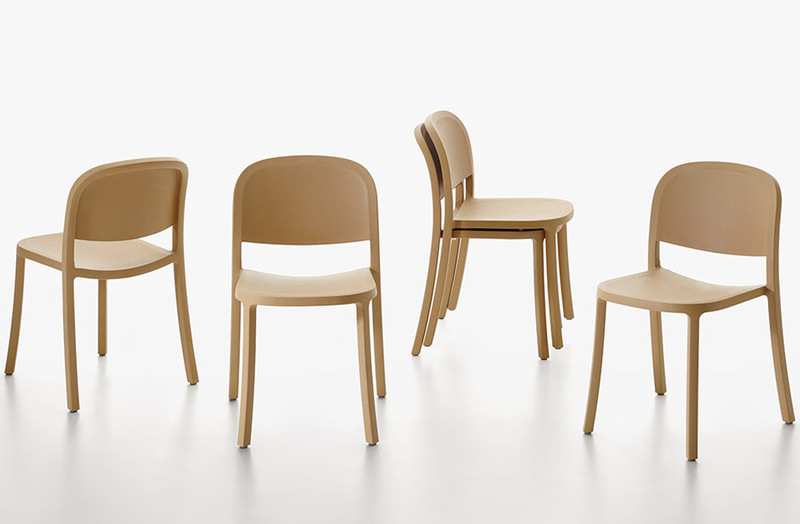 With 1 Inch Reclaimed, Emeco and Jasper Morrison affirm the combination of timeless design and sustainable materials. Most importantly, 1 Inch Reclaimed shows us that the material and engineering of a chair are critical, invisible design considerations. What you don’t see is as important as what you do see: 1 Inch Reclaimed is made with 90 percent industrial waste material consisting of 75 percent waste polypropylene and 15 percent waste wood fiber. A one-piece mono-block stackable chair, that is useful and durable, engineered to meet the demands of high use environments, 1 Inch Reclaimed is suitable for both indoor and outdoor use in all eight colours: Blue, Bordeaux, Sand, Brown, Dark Grey, Green, Light Grey and Ochre Red. 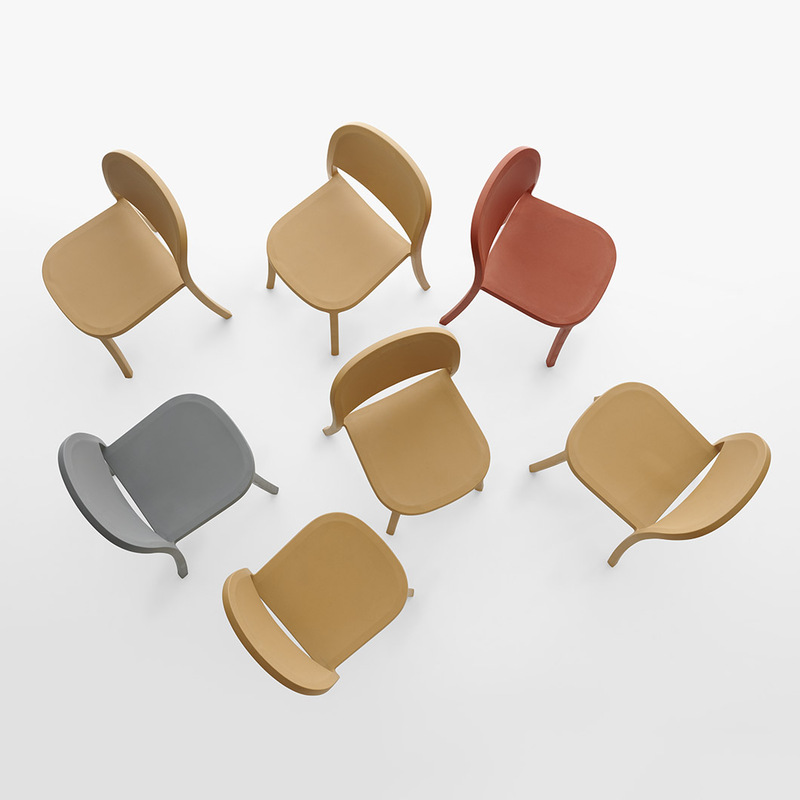 It joins the other 1 Inch family members – chairs, armchairs, stools and tables made of hand-crafted recycled aluminium frames combined with reclaimed wood polypropylene, plywood and upholstered seats. “The material used in 1 Inch Reclaimed chair, which Emeco has been using for several years now, makes use of the polypropylene waste at injection moulding plants, mixes it with waste sawdust from the woodworking industry and results in a warmer, more natural touch than raw polypropylene,” says designer Jasper Morrison. The new 1 Inch Reclaimed chair follows the shape of last year’s 1 Inch with aluminium frame and reclaimed polypropylene seat and back, this time offering full recyclability without separation. “The square tubular section structure of the 1 Inch Reclaimed chair is emblematic of the signature square aluminium tubing Emeco use to produce its famous Navy Chair, and the design itself is a play on the visual codes and identity which the square tubes have given to Emeco,” adds Morrison.